Like most controls, the RadChart also allow you to template it in order to change the control from the inside. 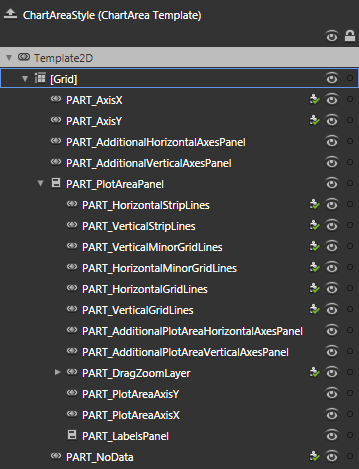 Except for templating the whole control, you can template only parts of it. This topic will make you familiar with the structure of the RadChart's templates. [Border] - represents the border around the RadChart and is of type Border. [Grid] - hosts the elements of the RadChart template and is of type Grid. PART_DefaultLayoutGrid - hosts the elements of the default layout and is of type Grid. 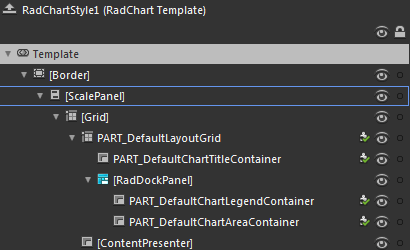 PART_DefaultChartTitleContainer - represents the container for the default title of the RadChart and is of type ContentPresenter. [RadDockPanel] - orders the containers for the chart area and the chart legend and is of type RadDockPanel. PART_DefaultChartLegendContainer - represents the container for the default legend of the RadChart and is of type ContentPresenter. PART_DefaultChartAreaContainer - represents the container for the default chart area of the RadChart and is of type ContentPresenter. [Grid] - hosts the elements of the ChartArea's template and is of type Grid. PART_AxisX - represents the x-axis of the ChartArea and is of type AxisX2D. PART_AxisY - represents the x-axis of the ChartArea and is of type AxisY2D. PART_AdditionalHorizontalAxesPanel - represents the container for the additional x-axes and is of type AdditionalAxes2DContainer. PART_AdditionalVerticalAxesPanel - represents the container for the additional y-axes and is of type AdditionalAxes2DContainer. PART_PloatAreaPanel - represents the container for the elements inside the plot area and is of type ClipPanel. PART_HorizontalStripLines - represents the horizontal strip lines and is of type HorizontalStripLines2D. PART_VerticalStripLines - represents the vertical strip lines and is of type VerticalStripLines2D. PART_VerticalMinorGridLines - represents the vertical minor grid lines and is of type VerticalMinorGridlines2D. PART_HorizontalMinorGridLines - represents the horizontal minor grid lines and is of type HorizontalMinorGridlines2D. PART_AdditionalPlotAreaHorizontalAxesPanel - represents the container for the additional x-axes of the PlotArea and is of type AdditionalPlotAreaAxes2DContainer. PART_AdditionalPlotAreaVerticalAxesPanel - represents the container for the additional y-axes of the PlotArea and is of type AdditionalPlotAreaAxes2DContainer. PART_DragZoomLayer - represents the control responsible for dragging and zooming inside the PlotArea and is of type DragZoomLayerControl. PART_PlotAreaAxisX - represents the x-axis of the PlotArea and is of type PlotAreaAxisX2D. PART_PlotAreaAxisY - represents the x-axis of the PlotArea and is of type PlotAreaAxisY2D. PART_LabelsPanel - represents the container for the labels inside the plot area and is of type LabelsPanel. PART_NoData - represents the control that appears when the RadCHart has no data and is of type NoDataControl. [Grid] - hosts the elements of the AxisX template and is of type Grid. PART_AxisSlider - represents the slider, which implements the scrolling and the zooming functionality and is of type RadSlider. PART_AxisLine - represents the line of the axis and is of type Line. PART_MinorTickPoints - represents the axis' ticks and is of type VerticalMinorTicks2D. PART_AxisLabels - represents the labels below the axis and is of type HorizontalAxisLabels2D. PART_AxisTitle - represents the axis title and is of type AxisTitle. [Grid] - hosts the elements of the AxisY template and is of type Grid. PART_AxisLabels - represents the labels below the axis and is of type VerticalAxisLabels2D. PART_MinorTickPoints - represents the axis' ticks and is of type HorizontalMinorTicks2D.